The Frog and The Bather, both 2018, color spit bite aquatint on gampi paper chine collé. Image 28 x 22 inches each. Printed by Sam Carr-Prindle. Since 2012, painter Mary Weatherford has included a neon element in her large, gestural abstractions: a glowing bar that zips across her already-luminous canvases like a lightning strike that never fades. Widely admired for her evocative, expressive brushwork, Weatherford has described her influences as being a combination of memory and place. (The neon was initially inspired by neon signs she encountered, flickering against the shifting twilit sky, during a stint as a visiting artist in Bakersfield.) Her paintings are “physical reflections of mood and positions…indexes of life lived, personal but also political,” says her LA dealer David Kordansky. no exception. These works aren’t just smaller, neon-less versions of her paintings, but rather images that could only be made the way that she built them: by applying big, juicy brushfuls of acid onto the surface of prepared copper plates, her gestures inspired in part by a visit to Point Reyes Seashore before her stint at the press began in December. Once etched into the plates, each set of marks has been printed in a rich black or a soft, watery blue. With titles like The Bather, The Robot, or The Frog, it would seem that there is some kind of reference is being made to people or things, though these relationships are never clarified. The deep, velvety blacks seem to sink into the luminous white of the paper. 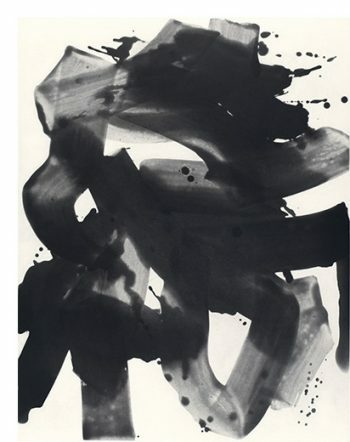 The more you look at these sweeping, seemingly effortless marks, the more there is to see. There are certainly ghosts of other artists present —Picasso, perhaps, in the bather, but also Franz Kline, Jackson Pollock and Mark Rothko. 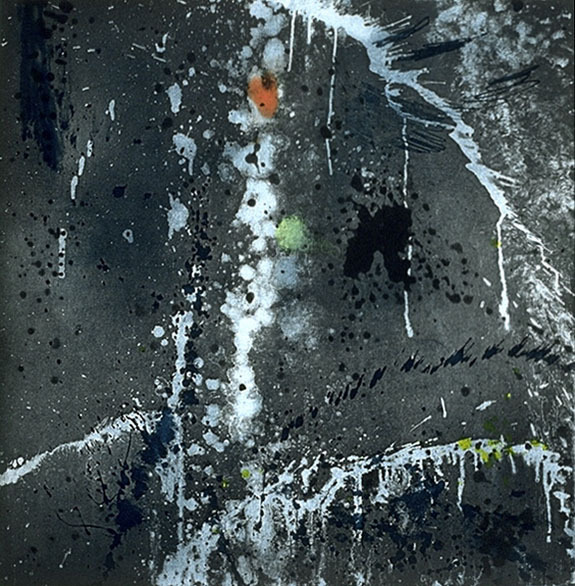 Weatherford freely appropriates as she invents her own version of expressive abstraction. The prints in an accompanying group show, Gesture, offer similarly exhilarating experiences of non-figurative mark making. With the exception of Brice Marden’s handsome but slightly dour rectangles of black on white from 1973 and John Zurier’s lovely pastel tripartite divisions of space from 2016, all of the other artists included are women. This brings to mind two books that detail the essential role of women in the story of postwar abstraction: Mary Gabriel’s Ninth Street Women: Lee Krasner, Elaine de Kooning, Grace Hartigan, Joan Mitchell, and Helen Frankenthaler: Five Painters and the Movement That Changed Modern Art (2018) and Katy Siegel’s The Heroine Paint: After Frankenthaler (2015). 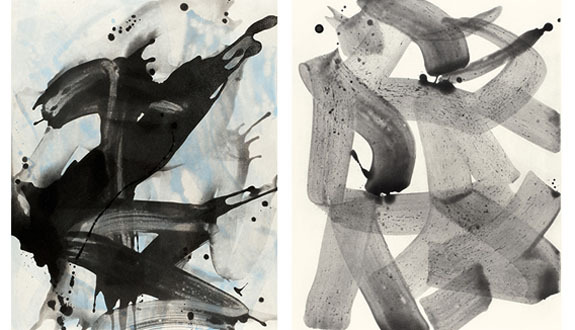 Seeing works by Pat Steir, Mary Heilman and Jacqueline Humphries side-by-side is both instructive and enjoyable. Heilman’s small but powerful Yellow Lineup (2016) is as buoyant as Humphries’ enigmatically titled (ryb) (2016) is brooding and apocalyptic. Then there’s the thrill of comparing the sharp, jumpy use of line placed against blocks of color in Amy Sillman’s O&N (2007) with the brilliant manipulation of lines intermixed with every possible shade of gray in Charline von Heyl’s Schmutzi (2014). In Gesture, Crown Point offers viewers a strong exhibition from its own archives, simultaneously refreshing our understanding of these artists by displaying their works as collector would, and creating a context for Weatherford’s newest works. Mary Weatherford and Gesture: a Group Exhibition @ Crown Point Press through May 4, 2019.